food: adventures in paleo | eat. drink. fly. so there’s something in this whole paleo thing that’s causing me some distress… it’s hummus. i live on hummus. it’s possible my body is 20% hummus at any given time. i feel like i belong with adam sandler in “you don’t mess with the zohan”. no hummus breaks my heart a little. i know, it seems like a weird thing to be sad about, but it’s actually causing my more distress than giving up bread did. you should know that i’ve got issues by now, lol. my paleo comfort food cookbook has a recipe for “paleo hummus” that i thought sounded pretty passable. tastes… like a dip, lol. but it lacks that dense texture that i love. this is almost fluffy. but it’s tasty and a keeper. but it’s not hummus. just sayin’. Preheat the oven to 400°. Prick the eggplants a few times with a fork and coat them in a bit of olive oil. Roast for 30 minutes (turning every 10 minutes) until they are tender. Cool before proceeding to the next step. Peel the eggplants and remove the stem. In a food processor, puree the eggplants until smooth. Add in garlic, tahini, lemon juice, cumin, salt & pepper. Puree until combined. While the food processor is running, drizzle in olive oil until combined. 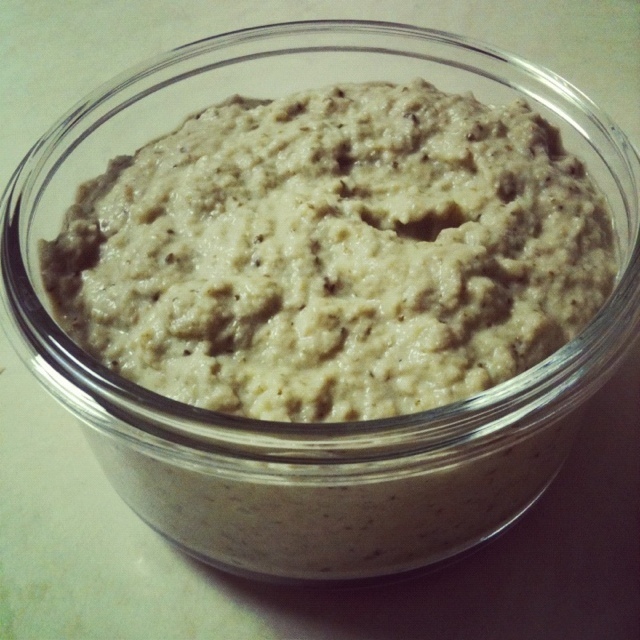 it uses zucchini and macadamia nuts instead of the eggplant recipe i used… which, by the way, i think is more like a baba ganoush than a hummus, for what its worth. in the meantime, here’s a paleo meal that i made a few days ago and it went over so well with my husband and me, that we’ve made it twice more since, lol. 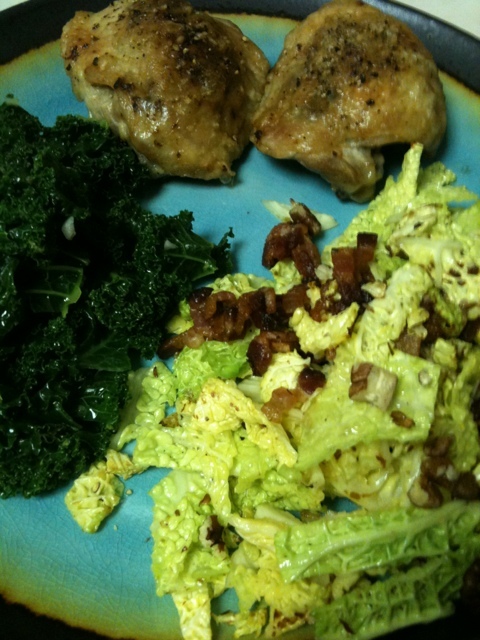 this, my friends, is pesto chicken thighs, cabbage with bacon and lemon kale. now, the lemon kale recipe, you’ve already seen here… and it is seriously already a household favourite. my greens-hating husband actually made it for himself. when i wasn’t home. that’s how good it is. the cabbage you see is basically a play on my brussel sprouts recipe that i adore. it’s shamefully easy and works so well with anything in the cabbage family. you just matchstick a couple pieces of bacon and fry them up… then throw the shredded cabbage or sprouts into the bacon fat and cook it until the desired doneness (we like it with some crunch still), salt & pepper it and throw on some crushed pecans and you’re good to go. the chicken thighs are also from my paleo book, but super easy. the big difference is that these are oven roasted on a rack. which i have never done before. i’ve always roasted my chicken on a pan, but the rack helps to get the skin extra crispy. also contributing to the crispy is the fact that i separated the chicken skin from the thigh almost completely… then i stuffed it with garlic, basil & parsley. and rubbed them down with some olive oil, salt & pepper. they roasted at 400 for about 35 minutes on the rack and came out golden, crispy on the outside and tender on the inside. the key here is good quality bone in skin on chicken thighs. ours, of course, come from hopcott farms. i never eat chicken skin… but i ate this. all of it. what i hate about chicken skin is that mushy gross jelly-like fat. this had none, it was all crisped to perfection. i think the higher heat and the separating it combined with the rack cooking was the magic combination. so that nugget of information has been filed away for future reference. also key, is the rub down with oil first. i know if seems redundant and excessive to rub fat with fat, but if you don’t oil the outside, the fat won’t work how its supposed to. think of it like basting a turkey. it doesn’t get crisp and lovely if you don’t pour that fat over it. so don’t skip that step. it’s important to the overall loveliness of the dish.